Now here’s a new web app that gives a whole new meaning to the phrase, “This message will self-destruct in five seconds…” However, some may argue that the concept is not new since “self-destructing” (more likely, self-deleting, in case you’re getting scared) is already being utilized by Burn Note and SnapChat. The concept of self-deletion is limited to Twitter only. With the new web app, Efemr, your tweets are automatically deleted after a pre-selected amount of time. However, unlike the aforementioned two sites, tweets are often seen and read by a wider audience. After granting access to your Twitter account, Efemr and you can choose a hashtag time limit to your Twitter messages. For instance, choosing #10 represents 10 minutes. Longer visibility can be done with #1h (1 hour), and so on. According to the Efemr website, the app is advertised as a tool “to protect your e-reputation and making your Twitter activity more fleeting.” While burn note and snap chat can claim this, it might be harder for Efemr to do so since people normally are fast in re-tweeting or having screenshots of the original message, and in a few minutes, it’s making its circulation rounds. For Twitter users, using Efemr to cover your tracks is not such a good idea. What it’s probably good for is cleaning up your tweets so you’re not left with months (or years) old messages that you forget to delete. Otherwise, it doesn’t take much effort to use the app so it’s worth giving Efemr a shot, if just to experience something new. Want something cool to gift this Christmas? Gadgets can be a sure thing but let's face it: consumer devices can cost your leg! If you want something unique yet geeky present for your tech-savvy friends, you may want to check out this new service of Firebox, the Twitter Poster. 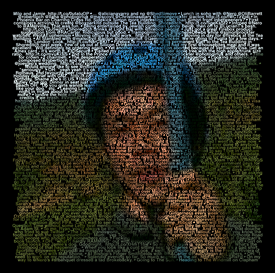 Twitter Poster is a unique personalised print of your Twitter profile picture, made entirely from your tweets! All your insights, musings, recommendations, or shout-outs on Twitter will make up the poster, making it the most insightful, immediate and revealing self- portrait you could ever own. To obtain your Twitter Poster all you have to do is to provide your Twitter username. That's it. No more privacy-invading tricks involved. As long as your Twitter account is available for the public to view, Firebox will collect as many of your recent tweets to fill the 61cm x 61cm poster. Firebox's Twitter Poster is a brilliantly geeky gift for friends, working colleagues and Twitter-savvy family members. Just click here to give it a try and see a preview of your finished poster. Twitter can only be fun and exciting when your Twitter feed is loaded with useful links and tweets from people/sources you truly care about. But certainly this is not always the case of Twitter. A lot of users love to flood Twitter updates that talk about gadgets or politics which -- for some -- is kind of distraction. We may not be able to control people what to post on Twitter, but we can always control what specific tweets we want to see in our feeds. Follow this simple guide on how to remove unwanted tweets on Twitter and display only tweet updates that you truly care about. I introduce you DeClutter, a handy Twitter filter plugin which allows you to remove unwanted tweets on Twitter using preformated text/keywords. If you hate seeing your Twitter feeds full of updates about iPads, SEO, Android, or "web traffic" you can always get rid of them using this useful bookmarklet. To start, visit DeClutter website. Provide a blacklist of words or phrases which you want to remove and drop the custom bookmarklet into your browser's toolbar. When you want to declutter your timeline, just hit the bookmarklet, and in seconds all tweets containing predefined keywords will be gone. 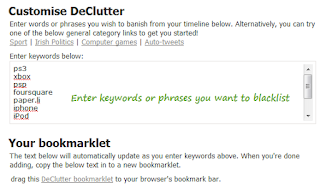 You can also refresh the list and append/remove more keywords by simply editing the source of the bookmarklet. Just right click the bookmarklet, select "properties" and edit the location field. The nice thing about Declutter Twitter bookmarklet is that it works from any web browser such like Opera, Firefox, Chrome, IE etc. -- no additional software needed. Ever wanted to know those people who visited your website and then tweeted your blogpost on Twitter? Do you want to track those users who're responsible for making your website or blog post viral on the internet? This post will introduce you to another awesome online service that will let you identify those people who are tweeting about your website or blogpost on Twitter. 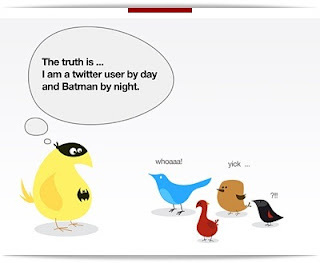 Here you will know how your web content are shared and discussed on Twitter. If you're looking for ways on how to find out those users who have tweeted your website/blog post on Twitter, you may want to try BackType, a social data analyzing company based in California, USA. One exciting part about BackType is that it can smartly return a list of names who have shared your blog post on Twitter in realtime. To start, just go to BackType, enter your blog URL (e.g. rushlywritten.com) and hit "Search". BackType will then perform a reverse URL lookup for all the links shared on Twitter that point back to your website! And in seconds you should see a list of users who have tweeted your post on Twitter. You can also perform Twitter search for your specific blog post or page instead of the mainpage; just enter the blogpost URL and hit search. The best thing about BackType is that it scans all the recent links posted on Twitter and shows you the results regardless of widgets, URL shorteners or plugins being used by the sharer. The free version of BackType requires no registration or signups, however signing up for the premium service of BackType enables you to enjoy much advanced controls such as Google Analytics integration, Twitter reach, detaile statistics, advanced search and more. Similar online tool you may want to try for free is WebDigg.net, a young web catalog service that accumulates data related to websites. It also scans and returns recent links shared on Twitter with links that point back to your blog -- works almost the same as BackType. If you find this post useful, kindly share/tweet this. Create awesome standalone Contact Us form for your WordPress, Blogger, Typepad, Tumblr,etc. Update: BackType is no longer available. But here's a good alternative. Just in case you didn’t know, you can automatically update your Twitter status every time you post a new blog entry on your weblog. That is, you don’t need to manually tweet your new blog post yourself as you can always automate the whole update process using this free twitter service – Twitterfeed. Twitterfeed is a free service that allows you to feed your blog post to Twitter. If you have a web blog and you’re tired of summarizing and posting your new blog post to Twitter, then, Twitterfeed is sure a must have application for you. Simple. Once you’ve performed the whole setup process, Twitterfeed automatically create a shortened URL of your blog post and send it to your Twitter account as an update. Here’s how you can automatically tweet your blog post to twitter using Twitterfeed. Step 1 – Create your account on Twitterfeed - Registration is free and easy. Just provide your valid email address and a password. You can also use an open ID if you have. Step 2 – Authenticate your Twitter account - Now, you need to authenticate your Twitter account – just provide a valid Twitter email/username with the corresponding password. Step 3 - Add your blog feed - Now you need to provide a valid RSS URL for your blog. If you’re using Blogger, Wordpress or Typepad, this should be a whole lot simple process for you. Just go to your blog and look for a label or button “RSS” or “Atom”, you should be able to obtain your blog feed URL. If you’re offered with syndication options, go for “RSS 2.0” as Twitterfeed works best with RSS 2.0 technology. If you can’t seem figure out your blog feed URL, do a search or go to the help section of your blog provider. Step 4 – Choose URL shortening company - The task of Twitterfeed is to automate the update process every time you post a new blog entry on your blog using shortened URL. Now you have the option to choose your preferred URL shortening service. Just specify the free URL shortening service of your choice and that’s it. Step 5 - Specify how often Twitterfeed update your Twitter status - You also have the option to specify how frequent Twitterfeed should fetch your blog post and auto-tweet it to your Twitter account. You can instruct Twitterfeed to auto-tweet your blog post within 30 minutes from the time of post. You can now post audio/voice message as attachment to your status updates on Twitter with Twaud.io -- another cool web service that lets you share audio, MP3 with your Twitter followers. You can think of it as Twitpic but for audio/mp3s. Uploading audio, voice message on Twitter is really easy. Just click either upload or record, upload your mp3 file or record it directly on the site and add a message and Twaud.io will tweet it on your behalf providing a nice short link to a page where your followers can listen to and comment on your audio clip. You can even see how many visitors it has had. Alternatively, you can email your recorded/saved audio to Twaud.io. especially if you're on the go. It works seamlessly on iPhone Voice Memos and other devices. Twaud.io is another cool web service for Twitter that deserves a try!